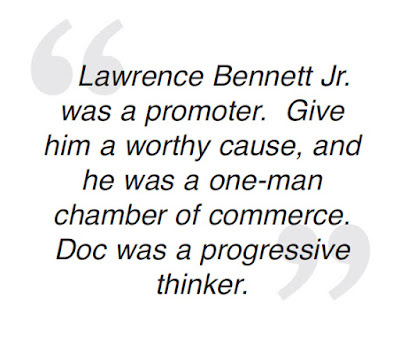 DinkNeSmith.com: ‘He cared’ describes life of Dr. Lawrence Bennett Jr.
‘He cared’ describes life of Dr. Lawrence Bennett Jr.
As an antsy kid—sitting in his Cherry Street office—I heard a grinding noise coming from the next room. I could see what looked like a big hypodermic needle under a white cloth. I tried to imagine what was going to happen to me. A drill was going to be whirring in my mouth. But first, that big needle was going to be poked into my gum. In a calming way, the young dentist peppered me with questions. I got my first lesson in how to talk when someone has his hands in your mouth. That was a classic Doc. Our children learned to swim in the Bennetts’ pool. In addition to Larry and Jann Bennett’s four daughters—Julie, Widget, Jody and Maggie—their Palm Street backyard was always teeming with children and adults. While some were on the tennis court, others were splashing in the pool. Future Olympic gold-medal swimmer David Larson was among them. When Doc retired, he didn’t slow down. He told me that men in his family had a history of dying young with heart disease. He was determined to defy the odds. He played competitive tennis and pedaled his bike all over Georgia. After Doc could no longer jog, he wore out a truckload of tennis shoes walking around Jesup. When he couldn’t take those strolls, he exercised his mind—even more. Years ago, he told me that he learned to speak Spanish watching Spanish soap operas. And in his final days, he quoted Latin from his hospital bed. 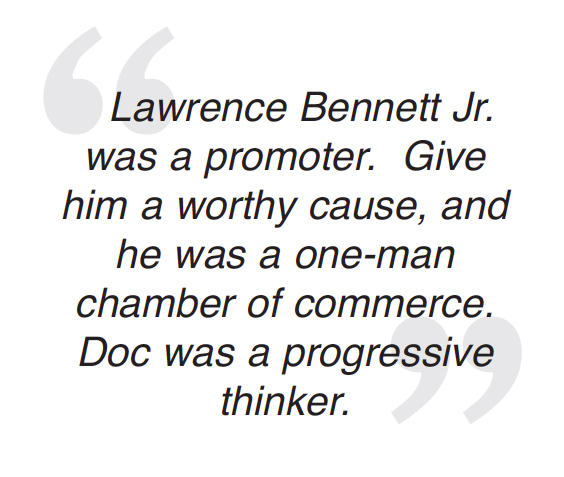 Lawrence Bennett Jr. was a promoter. Give him a worthy cause, and he was a one-man chamber of commerce. Doc was a progressive thinker. He believed that small people thinking small kept a small town small. I can’t wait to see the list he dictated to Air. For 91 years, Doc cared about his family, his friends, St. Paul’s Episcopal Church, his community and the world.